A luxurious conditioner that revitalizes and retexturises dry and damaged hair. Kama Ayurveda Lavender Patchouli Hair Conditioner is a rich formula that transforms dry, brittle hair by sealing in a rich blend of lipids and essential ingredients to continually nourish and hydrate the hair. This conditioner is infused with almond, Indian gooseberry and soy extracts that not only help maintain moisture, but also protect from daily stresses and further damage. Soothing lavender essential oil calms the scalp to heal irritation and infections. Refreshing patchouli essential oil acts as a natural antibacterial, antiseptic and anti-inflammatory active to repair scalp damage. This herbal blend gives beautiful, shiny and healthy hair with every wash. Explore the entire range of Conditioner available on Nykaa. 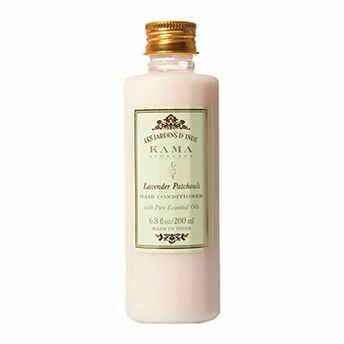 Shop more Kama Ayurveda products here.You can browse through the complete world of Kama Ayurveda Conditioner .Alternatively, you can also find many more products from the Kama Ayurveda Lavender Patchouli Hair Conditioner range.